GPRating (General Purpose Rating course), it’s a 6 months pre-sea training course post which you can start working on the ship. NCV (Near Coastal Voyage), it’s a 30 months training course which includes 6 months initial academic training and 24 months sea training. Both the mentioned courses require an age limit of 17-25 years along with a matriculation certificate from a recognised board with a background of Mathematics, Science and English. One has to be physically fit with perfect eyesight and no major surgeries to join merchant navy after 10th. Along with all the mentioned eligibility criteria which require documented proofs, you need to be mentally sound and strong as well. The field you are choosing for yourself requires you to spend a major part of your time on water with a very limited set of people and almost a monotonous routine, which requires a strong will, physical fitness and patience. This might sound normal but once you get into it, it becomes a big challenge to stay away from family and friends for such a long duration without any social life. Merchant navy as an occupation definitely sounds very lucrative in all terms. You get to travel across the world; you get impressive packages and immense opportunities of growth. But like everything else, all of this also comes with a challenging life. One has to be very attentive, responsive and spontaneous in order to deal with the different conditions, environments and weather challenges. Keeping in mind that you will be practically on water almost all the time, you have to be adaptive towards the fluctuating surrounding conditions. This is the reason why one has to choose the maritime academy very wisely, so that you get the best training and the closest idea of how the on ship life will be. 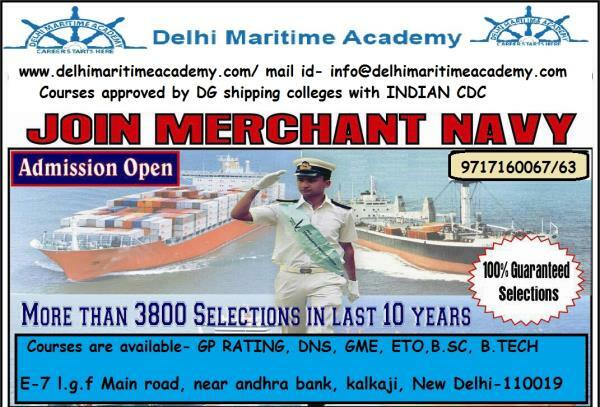 Indeed such courses prepare you well for Merchant navy in Delhi.